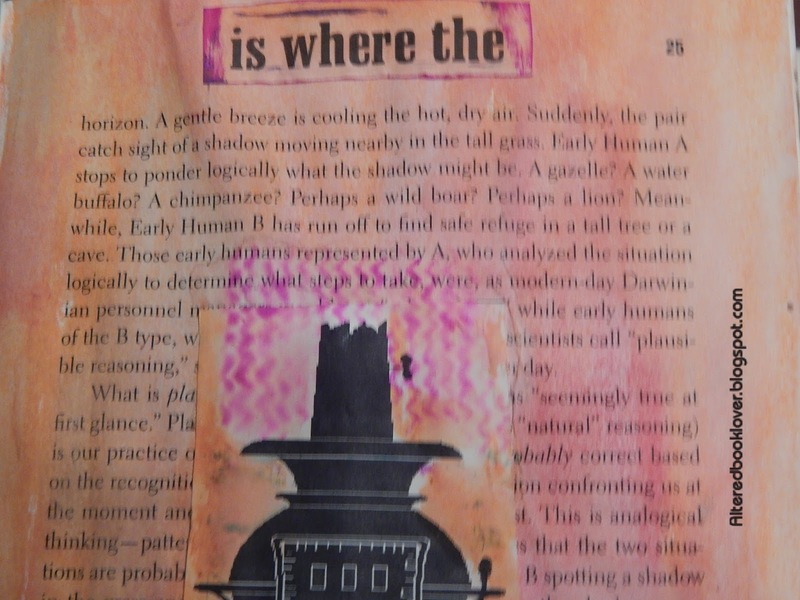 Today I'm once again joining Chris from PearShapedCrafting who is this month's host at Art Journal Journey. Chris wants us to suggest 101 Ways to Stay Warm. 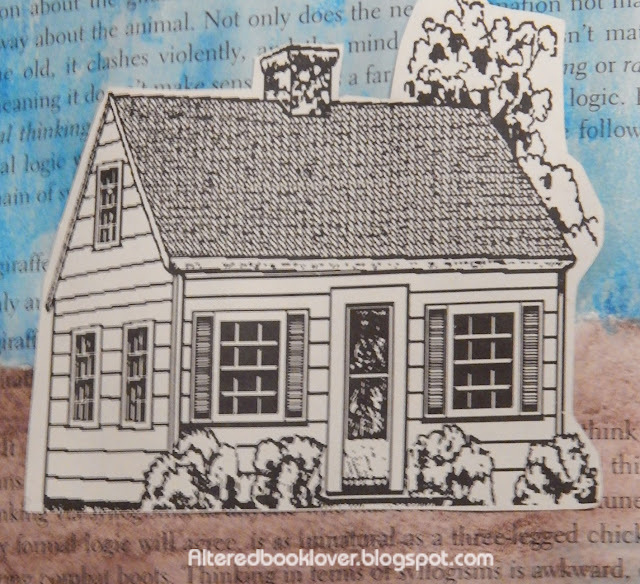 I'm also joining the wonderful ladies at Try it on Tuesday whose theme this fortnight is Home Sweet Home. and I suspect it will be easy to heat. 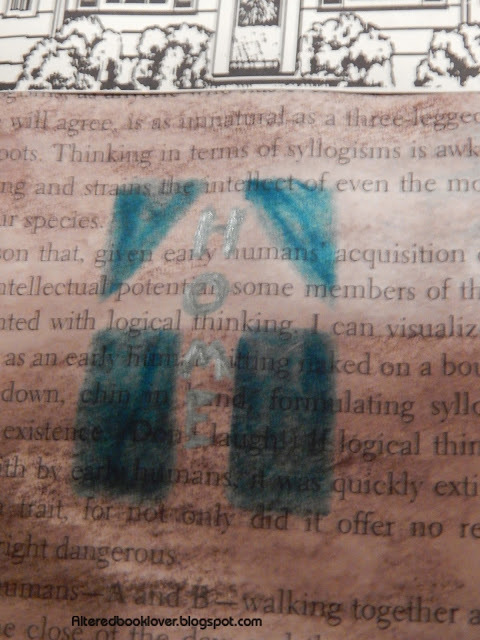 It's almost as if this stencil and the word I wrote are out of focus. Maybe it's easier to see here. I cut a pot belly stove from a book and colored the background to match the page's color. 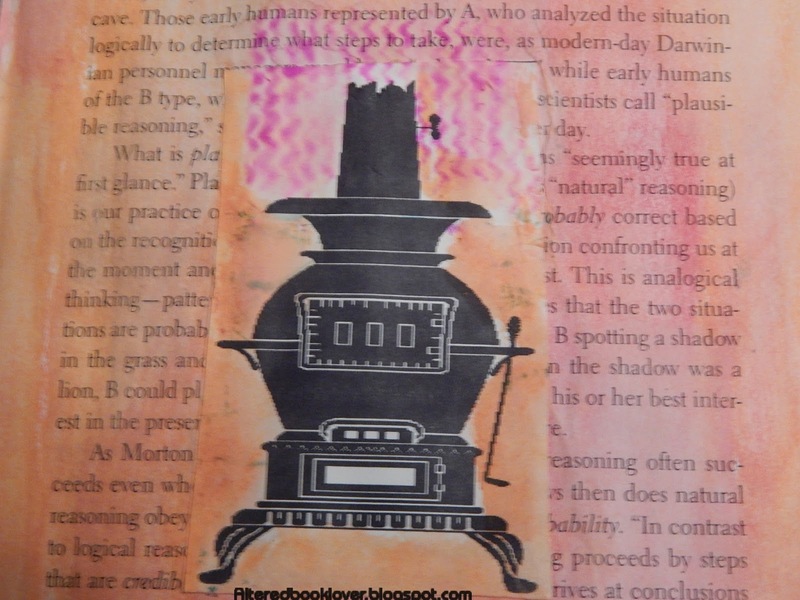 When I saw the zig zags on one of my new stencils, it reminded me of heat radiating from one of those old stoves. 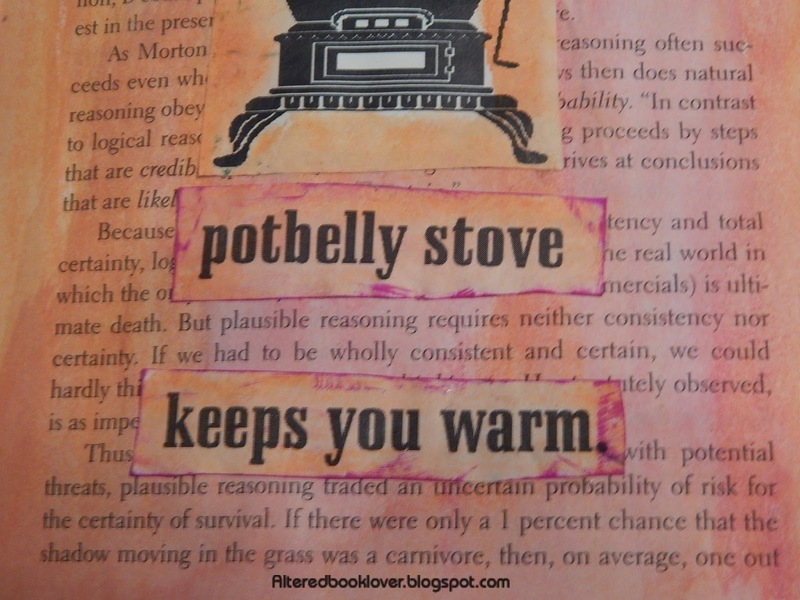 I used to have one of those old stoves when I lived in a different state. Just a bit of play on the phrase "Home is where the heart is." 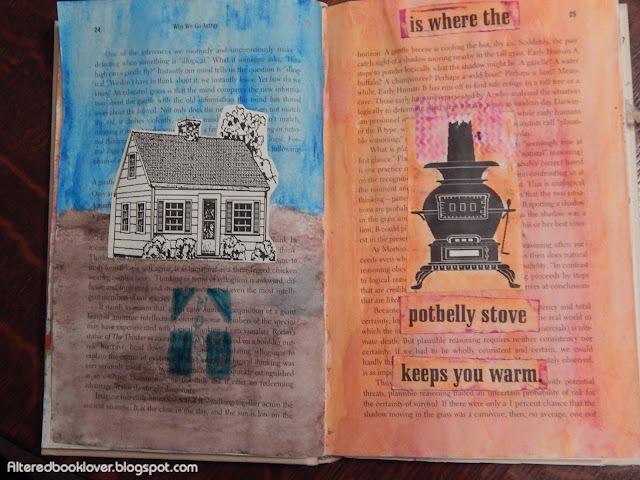 For this spread I tried to tie the two pages together by using different colored watercolor crayons. 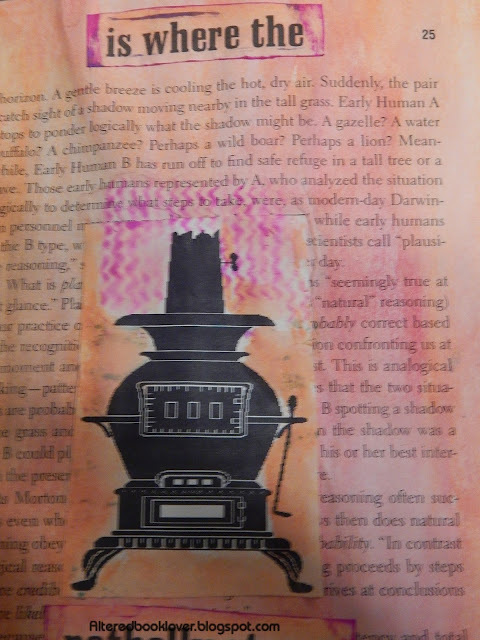 Both images came from a book, which surprised me, since I normally look in magazines to find my images. The words on the right were computer generated, colored with more watercolor crayon, and outlined in pigment ink. I used one of my new stencils on both pages using pigment inks. I wrote the word using a green Gelly pen. 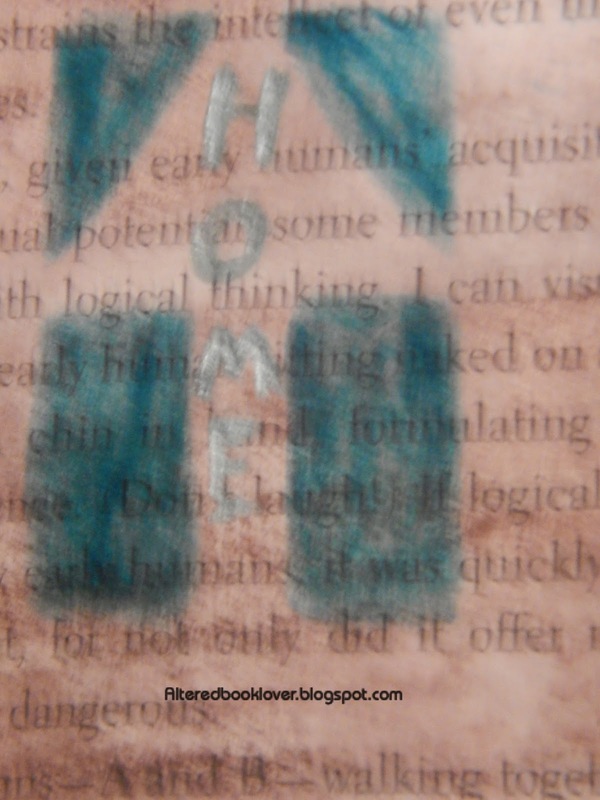 This is Day 13 and I am joining AEDM, Try it on Tuesday, and Art Journal Journey. Today I created another spread in my Challenges altered book. Thank you beyond belief for joining me today. Have a great start of the new week my friend! You managed to create something great and to combine two challenges in one. I like the way you think, LOL! Very colorful, very nice way of meeting those challenges. This is stunning page! Thank you for joining us at TioT. Instead of seeing the window with curtains and with home written in the stencil, it also looks like an arrow pointing to the house. Home is where the hearth, heart, and warmth is. Thoughtful spread as we move closer to Thanksgiving. I think a home with a stove like this will be really cosy and warm. Its a sweet house and the journal spread looks fantastic, with the colours you used. Thank you for sharing with us at TioT's, its lovely having you join us again. This piece has such a warm fuzzy feel to it. Love it. Regarding TNR (trap, neuter, release), yup, it's been around for awhile. I was a member of the Feral Cat Society here several years when we had one. Are you familiar with Alley Cat Allies? They basically started the movement. I especially like the way you showed the heat radiating from that stove. I want to hold my hands close! This is a fun project to watch unfold. 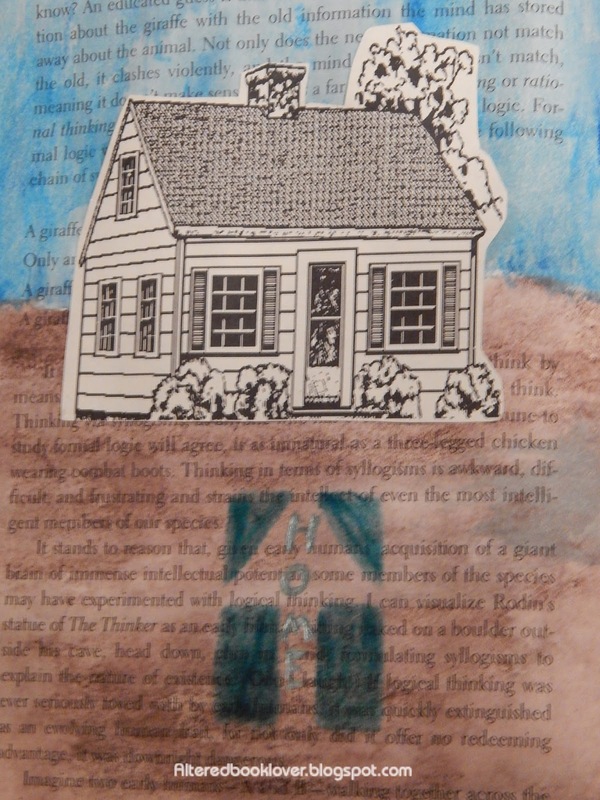 I am sure the finished project will be fun to go back through, the whole being greater than the sum - great energy! You used wonderful warm colors for the background of this very special potbelly stove! Nice spread -- and it definitely fits the theme like a glove! I thought this journal spread looks great. 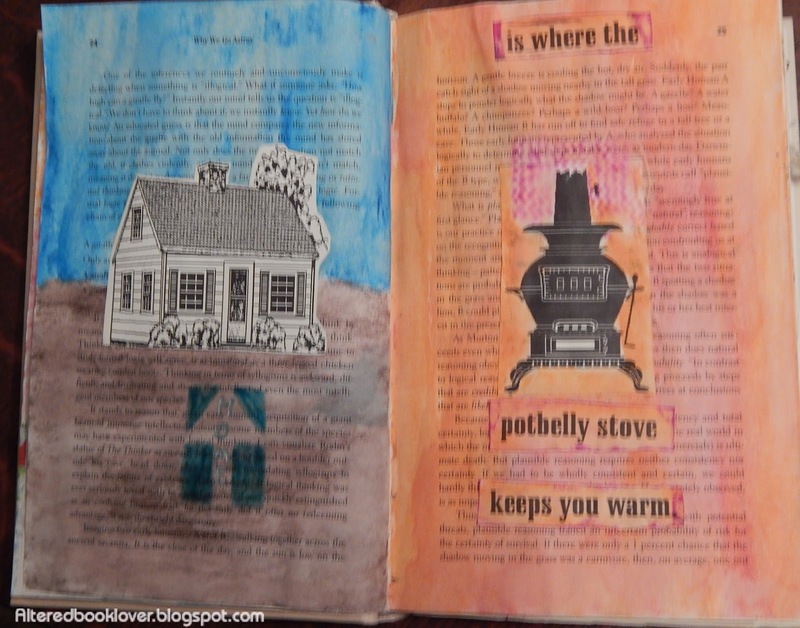 Great pages, could do with that pot bellied stove tonight, so cold!